It was another beautiful Fall Sunday, which means we had a chance to visit yet one more cider mill. 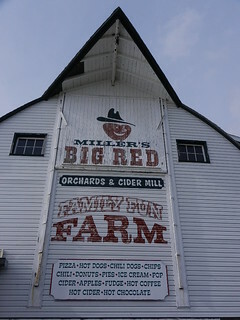 This time we went north to 32 Mile to Miller’s Big Red, the oldest U-Pick apple orchard in Washington Township. 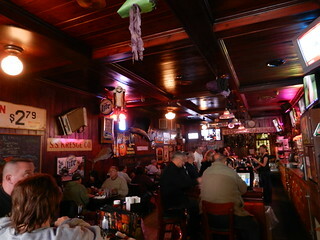 You’ll recognize Miller’s immediately by the giant smiling apple wearing a green hat. 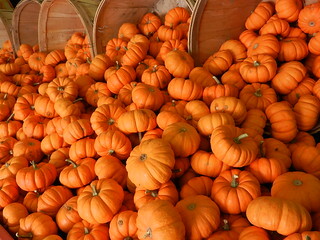 We took a walk through the greenhouse first to check out the pumpkin selection, it was the day before Halloween, so the pumpkins that remained were displayed down the center aisle. Families walked about pushing their cart deciding which ones would serve as their jack-o-lanterns. It seems the children always go for size, the bigger the better, dad reluctantly agrees as he loads it on the cart and pushes towards the check out. Next up, the cider mill; they were not pressing the apples but it was still interesting to see the equipment and the cider making process. Miller’s offers a nice variety of goodies; fresh baked pies, breads, caramel apples with nuts, sprinkles, or candies. There are jams and jellies and of course cider and donuts! It’s impossible to leave the building without a warm donut and a cup of cider, for me that is the essence of Autumn. 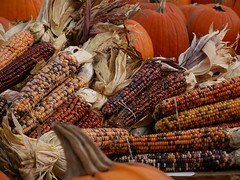 Groups of people were arriving, some heading to the petting farm, others gathered for a hayride, all enjoying the mild temperatures and brilliant colors of an October day in south eastern Michigan. Just a short drive away you will find the charming Village of Romeo. The actual downtown and original neighborhood have changed very little from the 1850’s when wealthy timber families were building Victorian beauties up and down local streets. Drive through the village on any ordinary day, the homes are nurtured and well-kept with large trees that line the streets. It is all quite peaceful and takes you back to a time when things were simple and slow-paced. But, drive through in October and things look a little different; skeletons and ghouls reign as front yards are turned into cemeteries, clusters of carved out pumpkins rest on porches, the windows of houses are boarded up, and entire homes are wrapped up in webs of what must be gigantic spiders. This is Tillson Street in October! 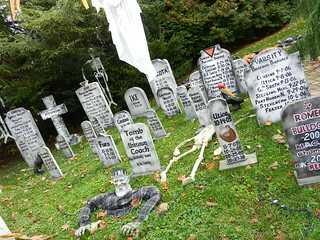 For over 20 years and counting Terror On Tillson has become one of Romeo’s biggest tourist draws. 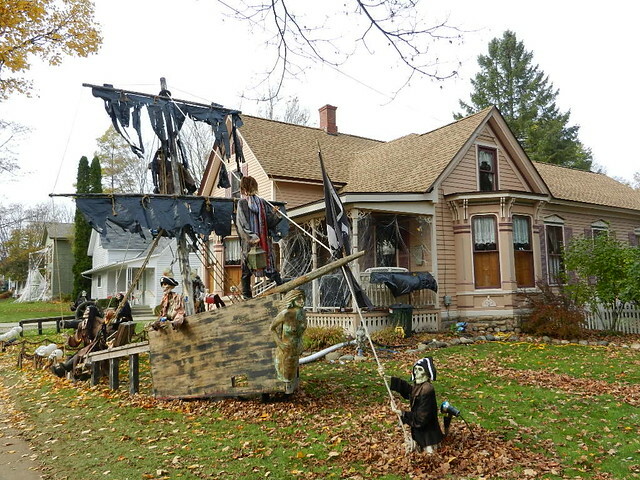 Beginning early in the month neighbors begin the slow and complicated process of decorating for Halloween, you might be asking yourself, what’s she talking about? It’s Halloween, how complicated can that be? Well, let me first say, these are no ordinary decorations! 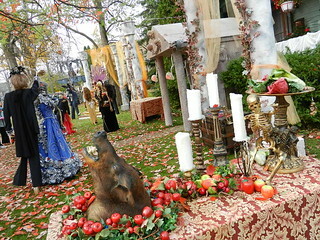 I would compare it more to a movie set than decorating, scenes are elaborate; from graveyards complete with wrought iron looking fences and clever headstones, to a cornfield complete with scarecrows, and a grand masquerade ball. There’s a castle and a pirate ship, one house even has an electric chair. 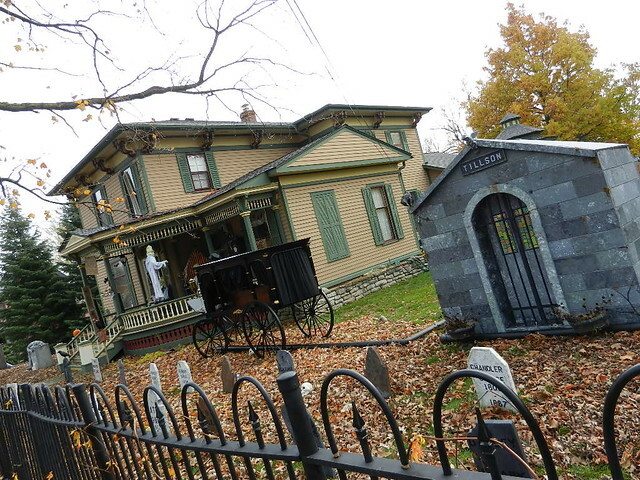 The creativity is awe-inspiring; fog machines, spooky music, cellar doors clamor and light peeks through as something tries to escape, nearby a hearse is parked on a lawn. It is absolutely amazing, really. 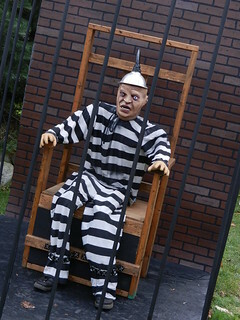 If you have small children I would recommend visiting during daylight hours, at night the scariness level goes up a whole bunch of notches, adults gasp as they are startled by special effects. One house sells T-shirts, a neighborhood cookbook, and refreshments, with all of the proceeds going to academic and athletic scholarships for Romeo High School Students. The homeowners pay for everything, including the candy they pass out to trick-or-treaters on Halloween. They estimate they get about 2000 children! The street is closed off at that time for safety reasons. It is truly a unique event that you have to see for yourself. Thee Office Pub & Cookery is located on South Main in downtown Romeo. They say as a small town Romeo is unique because the downtown never suffered a major fire, therefore many of the buildings and their interiors are original, most with ornate tin ceilings. Thee Office Pub is one such example, exposed brick walls, rich dark wood and decorative ceiling give it that historic charm. Opened since 1980 it is a neighborhood favorite, on our visit it seemed as though patrons and staff were all old friends. 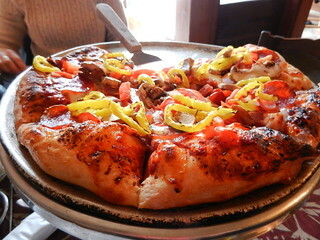 The menu’s offerings include sandwiches, homemade soups, burgers and pizza. On the suggestion of a friend we ordered a small pizza with our selected toppings and an antipasto salad. The pizza was 8 good-size slices, the crust thin and tender, very good. The antipasto could probably feed more than 2, but we were really hungry. Crisp lettuce, chunks of ham and salami, peppers, onions, tomatoes and shredded cheese, delicious. All in all we had a great afternoon get away.